Everything you need to get started with our 3D printing and traditional manufacturing services. RapidMade offers a range of plastic and metal manufacturing services to ensure that we always use the best technology for your project. You can learn more about any option by clicking on it. For full specs on all of our materials, check out our Materials Guide. The fastest, most cost effective plastic printing solution on the market. Superior mechanical strength, finish and fine detail. The best option for most 3D printed plastic projects. Inexpensive and highly customizable option for creating trays, packaging and more. Uses durable thermoplastics with excellent thermal and mechanical properties. Quick and durable 3D printed plastic parts. Compatible with a variety of materials. Very accurate for large plastic products. Less suited for fine details. High-quality surface finish and unmatched accuracy, especially for fine details. Well suited for small- to medium-sized production runs, including rapid prototyping. Generally more expensive than 3D printing. Excellent thermal and mechanical properties. Printed plastics can be hard, tough, or flexible as needed. Very cost effective at high volumes. Large, thick parts can warp. A faster, less expensive alternative to injection molding for small- to medium-sized runs with lower tooling costs and shorter lead times. Produces high-quality parts with detailed textures and consumer-quality finishes. The best way to produce full-color 3D printed plastic models with a full gradient of 339,000 colors. Very fast and inexpensive. Works best for medium to large products, as details smaller than 0.100” can be brittle. The tried-and-true method for high-volume manufacturing with the best quality and lowest cost. 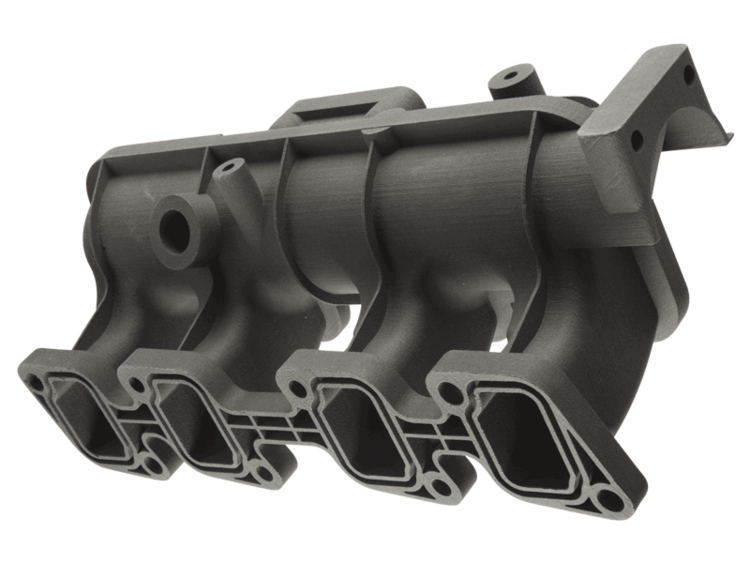 Longer lead times and higher tooling costs than 3D printing mean injection molding is generally not suited for smaller orders. Excellent surface finish, complex textures and fine details. Resins available in rubbery or rigid textures. Less appropriate for large plastic parts due to lower heat resistance. The best (and sometimes only) option for very large printed plastic parts. Great alternative to traditional machining for casting patterns and molds. Less durable than SLS or FDM. The most cost effective option for manufacturing metal parts, with the widest range of materials, highest tolerances and best surface finish. Useful for complex designs or exotic metals that would be prohibitively expensive to produce with traditional machining. Designs generally cannot be larger than 10”. Substantially less expensive than DMLS, but only compatible with stainless steel bronze alloy. Lower strength to weight ratio than other metals. Longer lead time relative to other 3D technologies. Our custom finishing services allow you to further improve the aesthetics, durability and branding of your products. Click any finish to get more information, including price and materials details. Standard dyes include include black, red, blue, green, purple and orange, with custom dyes available on request. Opaque dyes are available for PolyJet and FDM. PolyJet also supports translucent dyes. Multi Jet Fusion and SLS both have opaque black options. These standard finishes are available on almost all RapidMade products. They provide smoother textures and higher quality, consumer-grade feel. We are also able to simulate wood texture on ColorJet parts. We can create clear topcoats as well as single- and multi-color custom paint finishes on almost all RapidMade products. Paints are available in matte, satin and gloss. Available on most of our products, custom coatings like Teflon, Cerakote and polyurethane improve abrasion resistance, enhance appearance and reduce friction. Polishing improves resistance to abrasion and makes parts easier to clean and sterilize. It also amplifies the appearance of secondary finishes like anodizing, silk screen, plating and powder coating. Great for surface conductivity and electromagnetic interference applications, plating adds strength and rigidity to plastic parts while providing an elegant, metal-like appearance. It further improves the appearance of metal products. Powder coating is an inexpensive, permanent finish which protects metals from scratches, rust and corrosion while hiding imperfections. It has a smaller environmental impact than other coating processes. Anodizing prevents corrosion on aluminum components, creates a harder surface that is more resistant to wear and comes in many color options. Less expensive than CNC engraving, laser engraving is simple to create. It can be done directly from a PDF and allows for custom branding or engraving part and serial numbers. CAD files are the best way to send us your design. This list shows our favorite file types in order of preference. If your file type does not appear below, we can probably still work with it. If you do not have a CAD file, you may be interested in our product design and engineering services. *While we can use SketchUp files, extra engineering fees may apply to convert them into usable geometry. Once you’re ready, request a quote using our Get a Quote tool. RapidMade engineers will review your project and get back to you with a price within 24 hours. Check out our 3D Printing FAQ or reach out to us directly. A RapidMade representative will be happy to answer any questions you may have.